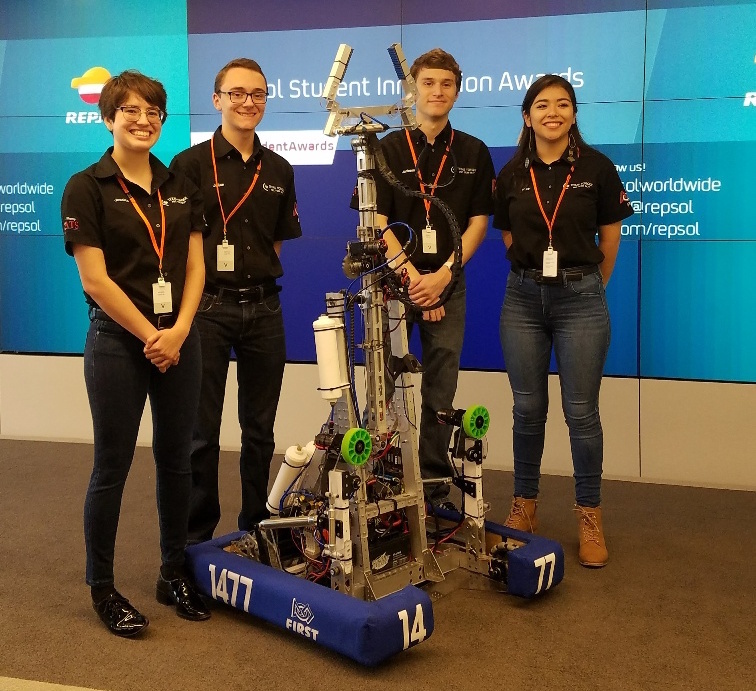 On Thursday, April 12, Texas Torque was invited to attend the Repsol Student Awards, an event created by Repsol to recognize students who placed first in any local STEM related school district competition. 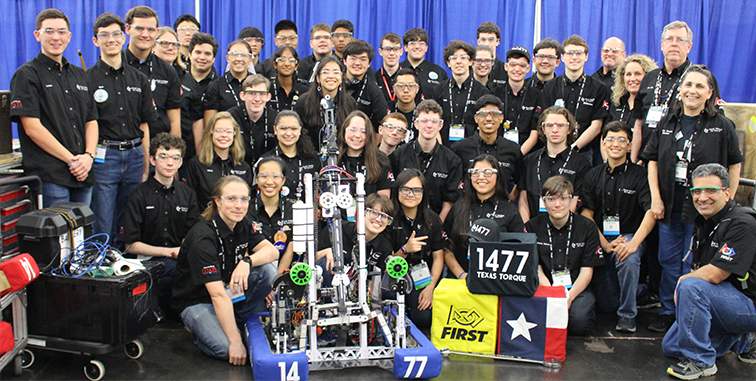 We demonstrated our 2018 robot “Bravo”, a version of our bagged competition robot, which we built for drive team practice in our lab. Although the stage space was too small to fully use and extend our robotic arm, we were able to invite NASA Astronaut Dr. Anna Lee Fisher to drive “Bravo” around the stage. 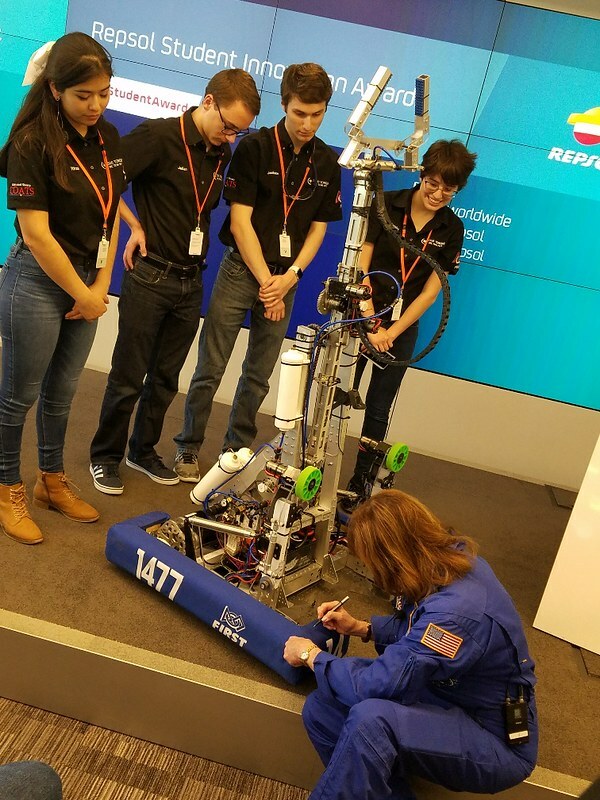 At the event, Texas Torque members had the opportunity to speak with Dr. John Charles, a NASA researcher and head scientist, Dr. Anna Lee Fisher, a NASA Astronaut and Medical doctor, the president of Repsol, and our school district’s remarkable superintendent Dr. Don Stockton. Both Dr. Charles and Dr. Fisher were kind enough to sign Bravo’s blue bumpers after taking group photos. A high-achieving local FLL team 983 had also been invited to the Repsol Student Award ceremony, and the FLL team presented their own homemade video showcasing their achievements, much like an FRC Chairman’s Award video. Texas Torque was honored to attend the event and we were happy to present our accomplishments to our local business community, from parents, to small business owners, to major corporations.